DIY Valentine’s Day Button Vase – Dollar Store! Oh Valentine! Who doesn’t love an easy Valentine’s Day craft! This is easy to make for all ages and appreciated by all as a homemade quirky craft. 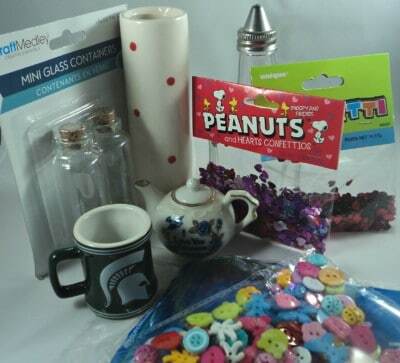 This is a cute Valentine’s Day Button Vase that uses materials from your craft stash and dollar store materials for an affordable creative gift. I love homemade gifts and reusing materials from your home is a bonus! This is a very straight forward Valentine’s Day craft! Thread the floral wire through one hole of the button. Slide the button to the 1/2 way measurement of the floral wire. Thread the floral wire through the second hole in the button. Flip the button over and twist each of the floral wires together to snugly attach the button to the floral wire. Then twist the floral wire. Hold one piece of floral wire straight and then twist the second floral wire around the first wire and sliding down. The twisting can be as tight or as loose and you desire. That’s it! Your button flower is now ready to put into the vase. For these two mini vases I used bottles found at the Dollar Store (2 for $1.00) and because the bottles were clear I used confetti for the filling to hide the floral wire. I found heart confetti and Snoopy confetti at the Dollar Store for $1.00 per pack. The vases took 1/2 of the confetti package to fill the mini bottle. How could I pass up Snoopy confetti! Buttons – Shank Or No Shank ? I used both. It does take a little more labor to use buttons with a shank but I wanted to use buttons from my craft stash and most of the vintage buttons had shanks. The advantage with no shank buttons is the ability to layer the buttons together for a cute Valentine flower. The Valentine’s Day Button Vase is a cute Valentine idea that can be made with craft materials from the Dollar Store! I purchased two vases, the confetti and floral wire for $1.00 a piece. The buttons I used from my craft sewing stash. Total cost of two Valentine’s Day Button Vases is $1.50 per vase and I had enough confetti and floral wire to make a few more vases. What Mom or Grandma or even Dad or Grandpa wouldn’t love a cute homemade Valentine’s day gift from their children or grandchildren? This is a very easy to make Valentine’s Day craft that is perfect as a fun thing to craft with the grandchildren due to its’ flexibility of design. Anything goes with the design and the floral wire is easily manipulated for young and older hands. I would recommend a lightweight floral wire for a project with the grandchildren. If you are looking at the gauge of floral wire then the highest number is the thinnest and most flexible; I found my green floral wire at the Dollar Store in the floral section. Adorable idea! Finally something to do with all those buttons that doesn’t require sewing!! Cute idea! I want make this for my mom! Enjoy! I’m sure you will make a cute one!